My favorite album of the year. I've never been into classical. I was really into Chilly Gonzalez's quartett album "Chambers" last year. If you want to listen to beautiful string arrangements with instant gratification I recommend it. He's also really fun live. Dog wrote: The "instant gratification" piece that was my gateway drug to classical was this borderline piece between jazz and classical I caught one day. Really liked the way a rather simple and beautiful melody was transformed/broken down/hidden/came back throughout the piece and the ability that presented to convey messages on an emotional level. Still find the piece really cool. Just give me timeless melodies and I eat that up. Also taking a nazi class this semester, pretty cool speak... you can get away with english and just pretend to nazi speak. I’ll just leave this alternate video here and move along. Set to Peter Jackson’s first movie “Bad Taste”. Dog wrote: Is it just me or does that sound like the Cranberries? I can hear that. Her voice timbre is similar and it's very dreamy melodic-wise. I like how it sounds like she's killing it on karaoke. Dog wrote: Did you give me rep for that because he's Russian born, nick? Dog wrote: Well, 95% is "partial". I also think you're aging gracefully. Here’s a piece by him I enjoy. I definitely know Philip Glass and Einaudi, but I'm not too familiar with minimalist genre. I do seem to gravitate around that type of music when it comes to classical. I've always described it as the "cinematic" sound, maybe minimalism is prevalent in film score music. And that's also where classical and electronica seem to co-exist. Dog wrote: yes, all these composers are prevalent in movie scores. glass and co are quite big in hollywood, to my understanding. i know of Ryuichi Sakamoto from the ones you referred to. also in the same sort of celebrity-ish circle i believe. never really listened to him. you vouch for him, retarder? Absolutely, I think you'll enjoy Sakamoto. That's "Merry Christmas Mr Lawrence" his most known composition. Sick... c'est pas Ajust qui fait tous ses tracks? Pauvre Larry Kid, Loud a plus de views en 15 minutes que lui en 6 mois..
Dans cet album c'est pas mal tout Ruffsound et Realmind qui ont fait les beats, deux de mes patnè. C'est un peu plus riche comme son, ça marche vraiment bien. Loud est beaucoup plus marketable que Lary j'pense. Dans cet album c'est pas mal tout Ruffsound et Realmind qui ont fait les beats, deux de mes patnè. C'est un peu plus riche comme son, ça marche vraiment bien. Loud est beaucoup plus marketable que Larry j'pense. C'est drôle, on en parlait entre amis avant hier.. à quel point Ajust fait toute la différence. Apparament non. 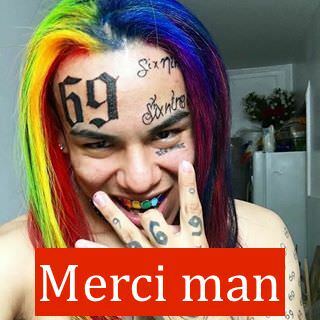 C'est des gars de mon coin, je connais bien Lary.. je feel vraiment pas son album though, full fâché. Quand est-ce que tu signes un gros track là? Je pense que Ajust à un gros input pareil, mais côté créatif c'est vraiment les 2 autres qui ont crée le son. J'ai entendu une couple de tracks à Lary pis malheureusement ça feel comme une parodie. Moi je continue à faire la musique stock et j'ai des tracks ici et là qu'on m'envoie à finir de L.A.. C'est tough la "pop game" là bas , la compétion + politiques...mais j'y retourne dans pas long. J'ai eu la chance de travailler sur le projet de Allie X cette année, j'ai fini par avoir eu une co-production.